We will close at the present by highlighting that space constantly retreats to the background whenever it is involved in a question. Turn your mind now to the concept of space, and try to fix your thoughts upon it. What comes into your mind? If there are any images of objects within space itself, clear them at once, since space itself cannot be that which it contains. Clear away all materiality from the conception, and fix your gaze upon space itself. Stripped of matter, what remains? What is space? What condition is necessary to make such an encounter of space, namely, as indefinable, possible? The answer can be brought into relief negatively: there must be something non-spatial about our very encounter of space, something which allows us to see it at first only as a backdrop that is always already there in our encounter of any object of experience, only to allow us to see it later on as an indefinable fore-ground that vexes our attempts to think it. And indeed, in the course of this shift, space itself does not change, yet our encounter with it changes emphatically. The implication being brought into relief has now become obvious:what is capable of constituting the condition for the possibility of any such shifting encounter of space is not space itself but something outside of space itself, something which, being other than space, could not simply reside alongside of space (in just another space, as it were), but would have, at the same time as it remained outside of and beyond space, to permeate it through and through. Of course, in keeping with this a priori permeation, the positive identity of this non-spatial condition has, even in this our present musing upon the definition of space, necessarily already been mentioned. Space is not only bordered by what already permeates it; it is defined by this very coinciding permeation: space is defined by being defined already, i.e. it is defined by time. Such an answer is in many ways a stock response. It is clearly drawn along Kantian lines, and is --like many things Kantian --easily incorporated into the System of Hegel. As Kant would have it, the pure inner intuition of time is not simply some complement to the pure outer intuition of space: time is not only inner intuition but also universal intuition. What is spatial is already temporal. What is important to see is that this universal status does not erase or correct time's designation as internal. Rather, time is universal intuition in a manner that outer intuition cannot be, and it must therefore be other than what is outer; it must be internal. Time must be internal intuition at the same time as it is universal intuition, and this alone vouchsafes its universal status. But what time is this, which would allow the intuition of time to be necessarily differentiated into what is internal and what is universal, while at and as the same time, insisting upon the necessity of their identity? By already highlighting the direction in which I was moving you have perhaps negated the need for me to remove the discussion from ellipsis. Yet I feel (as you might) that perhaps the solution of the supposed indefinability of space might consist in the rejection of the very existence of "space" by highlighting the manner in which it is an image of something quite different. Yes, in fact many fine contemporary continental scholars have taken just that direction ---although, perhaps they, and certainly I, would not refer to space as an image of this more primordial "etwas". I would in fact argue for the reverse, i.e. that space is not a derivative image but that it is derived from an image (obviously everything here depends upon what an image could and must be), but hopefully I can throw up a post that speaks to that in the next 2 weeks. Among the most notable --to my mind at least ---of the scholars of which I made mention above, Edward Casey and, above all, Jeff Malpas should be counted, both of whom have sought to demonstrate the derivative nature of space to place, but there are surely many others. On the other hand, as long as we are letting the credits roll, all of these topological studies have their decisive source in Heidegger, of course ---and indeed I think none of them have fully caught up yet with the trails Heidegger blazed in this, as in so many other, 'directions'. In fact, to a certain degree the post above is merely preparatory, and if it were expressed as a sketch or indication of a conclusive argument about what space "really is", I would have to disagree with every word of it, which I tried to indicate by confessing it "Kantian" situation. This is why I entitled the post 'LOST in Space." Again, I have intended to post a sequel to this, one which in a certain way will flat out contradict it. How do you understand the difference between "derivative image" and "derived from an image?" The intended difference here is, at least when formally expressed, by no means anything new (whether is is fittingly expressed in formal relation is a separate yet essential question). It is the difference between what is derived and what is original, between what is founded and what is foundational ( a distinction that is all too easily and thoughtlessly read off by people 'familiar' with Sein und Zeit). So, most succinctly: the derivative image would be one that is derived --in some way or other --from some more primordial thing. By contrast, that image from which something (x) is derived would be that in relation to which x can be be called derivative. In this latter case, the image is what is primordial. Thus, according to these formal relations as the are involved in the discussion at hand, the claim would be: space is derived from an image. Of course, if we think of image as a duplicate or representation, such a claim must either be disqualified from the outset or must reduce to a more primordial origin for which the "image" would simply serve as a mediation between what is original and what is derived. If we do not assume this to be a fitting understanding of the image, then we have to ask the basic question of what an image really is. And this is what I meant in the parenthetical aside above, "obviously everything here depends upon what an image could and must be". The question here is even more specific; it is not "what is an image" but "what must an image be"? How is the coinciding permeation of space by time a definition, rather than a fact about space? Could not one ask, if space were its own being permeated by time as something other, what would it be prior to this permeation such that it could be permeated? Or if this question is only the product of a bewitchment by the temporal and objective aura of the verb "permeate," what is responsible for this bewitchment and how may it be dissolved? "Or if this question is only the product of a bewitchment by the temporal and objective aura of the verb "permeate," what is responsible for this bewitchment and how may it be dissolved?" This a perceptive and critical question, so I did not feel, despite the new post on space (from yesterday), that it should slip through the cracks. I would like to take a sort of SZ approach to this --i.e. to speak of permeation as possessed of two fundamental possible senses, namely ontic permeation and ontological permeation. Nota Bene: Obviously we are dealing with a Kantian understanding right now, but the distinction between transcendental and empirical is by no means co-extensive with the early Heidegger's distinction between ontic and ontological. How then can I in good conscience propose to shift one distinction into an entirely different one? Because Heidegger himself does so constantly in his Kantbuch of 1929. In fact, he did this so much that many people misread him to be equating transcendental/empirical with ontological/ontic instead of vigilantly keeping in mind the transformation Heidegger was trying to enact from the former to the latter in his reading of the first Kritik. All that being said, the permeation that is at stake in time's permeation of the pure form of intuition of space in order to give that form its very definition and limitations)cannot be an ontic permeation...i.e. it cannot be an occurance in time which is how I read your "temporal and objective above", in other words, I am in agreement with this appraisal. And in support of this all one has to do is appreciate the fact that NO-THING is being permeated, since space is a pure form of intuition and only this. Therefore, in this permeation there is no actual happening that takes place, as if space was FIRST there, and then temporalized (since this FIRST marks the permeation). This would be ontic permeation. Instead, the Permeation is ontological insofar as it can only be regarded as happening in advance of space ---and this is precisely how it can permeate something that is itself a priori. There is, it occurs to me, another way of stating this difference of permeation: The event of permeation here under consideration is not an event in time, but it is event OF time. Time, we must also keep in mind, is thought here in terms of succession. The event OF TIME is not something happening, something coming to be or passing away or changing, but is rather an event of pure succession. The only answer, really, to Zeno's paradoxes of motion is that rather than motion being illusory, space is the illusory variable. If for instance I was to walk from my living room to my kitchen, what would be happening at the quantum level of the void is that each movement would move the form of the particles of my body through quantized formless matter. Since I have no sense that quantized formless matter "exists" I don't notice that the base particles of the atoms in my body are being constantly replaced as I move by forms of the void. To follow on from the last comment ... Time is not specifically a quantum measurement, but a measurement of entropy - i.e. Time occurs due to entropy rather than entropy occurring in time. This sounds convoluted if you model the universe as matter and energy, but neither of those are really as fundamental as once thought. The universe can also be modelled as information. 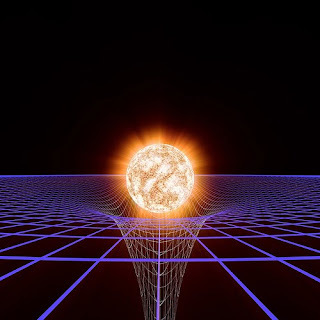 In this case the universe's computational possibilities measure out at about 10^120 x 10^140 (given degrees of gravitational freedom). The actualization of possibilities is what we know as entropy, a loss in future possibilities resulting from them already having occurred. Much as in human choice, the universe following a specific possibility results in many more possibilities becoming moot than ones actualized. Interestingly the rate of entropy in the universe is identical to that of human information (the study was done using entropy of email). Primordial Time on a shared level then would result from the entropy inherent in the shared World. Personal Time (the Time each of us are) results from the entropy inherent in our own (free) lives. Thanks for the remarks, Wev --your initiative to look "way, way back" is not one lost on someone such as myself ---in fact I will be rehearsing a certain version of Zeno's articulation of the problematic in a forthcoming post (a gesture that is also meant to reconsider the nod to Zeno made by Sebastian over at City in Speech, where the discussion first began). Regarding your attempt to re-situate the problematic of space amidst the terrain of quantum physics and thermodynamics, I would like also to follow the look to "go way, way back". I do not mean by this merely to look as far back as Zeno or any other time before him, chronologically conceived, but to look to that time which stands as a prequisite to any observation we can make of or about something IN TIME, i.e. that time that Kant calls the PURE FORM OF INTUITION. This "way. way back" stretches not to some ancient concept but to an A PRIORI one...indeed one which is conceived as a condition for the possibility of any conception whatsoever. How does this pertain to your attempted re-situation? You state that a proper answer to the problem of space as it emerges from Zeno's paradox depends upon the recognition that "rather than motion being illusory, space is the illusory variable." (Let me state right from the outset that it would probably be preferable to not have to sacrifice either one on the altar of illusion, if that is possible. And Aristotle himself points to a possibility which saves both "variables", as you put it.) However, even if, for the nonce, we suppose both that either motion or space must be illusory, and that, when properly understood, it is motion that is illusory, an intermediary consideration remains before we can cull the results or postulates of contemporary physics. THe consideration may be formulated in the form of the following question: In what manner do the possible measurements of contemporary science relate to the Kantian delineation of pure forms of intuition? Or to put things more directly: the proposed reduction of time and space to entropic and quantum measurement respectively still depends on conditions which make measurement possible. What according, to Kant are these? In order to measure something one must have SOMETHING to measure (an object in the Kantian sense, i.e. a composite or unity of two different representations, namely concept and intuition). Even the measurement of an abstract entity, e.g. a triangle, is supplied with these conditions. But Kant would maintain that the the constituents of the objective unity of representation, namely concept and intuition, themselves both depend in turn on a priori conditions, e.g the intuition depends on the two forms of intuition, namely space and time. So right from the outset, to the extent that entropy or quantum physics is dependent on intuition of any sort, it presupposes rather than explains time or space. Furthermore, any notion of measurement depends upon the establishment of the "unit" of measurement. But any unit itself depends upon time as pure succession (since this grounds the possibility of arithmetic). If one is unprepared to accept Kant's Transcendental Aesthetic, than it is incumbent upon him to say why and to offer an alternative 'answer'. In either case though, it is not sufficient to appeal to quantum, entropic, or any other kind of measurement, unless he has justified his ability to do so over against the Kantian demand for the transcendental conditions for such measurement. All that said, I do not mean to advocate for Kant, but only to take him seriously. Quick correction to the last comment: It should be obvious that instead of "However, even if, for the nonce, we suppose both that either motion or space must be illusory, and that, when properly understood, it is motion that is illusory..." the above comment should read: "However, even if, for the nonce, we suppose both that either motion or space must be illusory, and that, when properly understood, it is SPACE that is illusory..."
Anyhow, I did also want to further remark on Wev's final characterization of entropy as a concept that attempts to ground "personal time". Everything here depends upon how these concepts are ascertained. I would put the question this way: is pure time conceivable without entropy ---indeed MUST it be conceivable without entropy? Is entropy conceivable without time?